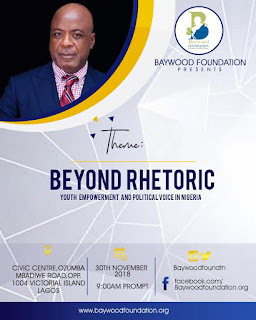 In line with the visionary mandate of youth empowerment and the political relevance of youths in governance, Baywood Foundation, a non governmental organisation has organised a youth conference themed "Beyond Rhetorics; youth empowerment and political voice in Nigeria. The must attend 2018 conference for youth empowerment and the fight for a better future for youths is slated to hold today by 9:00am, on the 30th of November, at the Civic center, Ozumba Mbadiwe road, opposite 1004, Victoria island Lagos. The conference and event is aimed at resuscitating the capacity and ability of youths in politics and governance, thereby engaging them with strategies and innovative pathways that can sustain the vision. The visionary occasion of national change and proactive engagements by youths will be chaired Mr. Emmanuel Igewere and Dr. Hussaini Abdu, the country director of Plan International, Abuja, as the keynote speaker at the conference. According to the convener of the conference and Country Director of Baywood Foundation, Prof Mike Ike Muonso, the conference will be emphasizing on the role of youths in politics by establishing a synergy amongst youths that can unequivocally maintain a prospective success for the future. The conference will have the presence of several outstanding personalities in relevant government and private agencies across Nigeria. The vision is to review the existing commitments of youths in politics and the possible strategies that can improve the involvement of youths in governance.